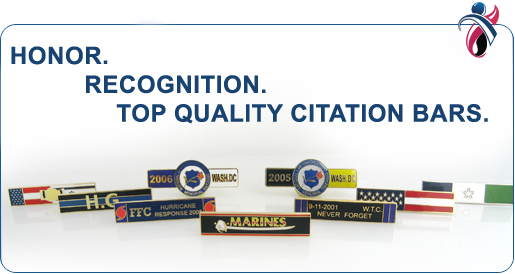 Citation bars are worn on uniforms to recognize the recipient’s bravery, honor and courage. The military was the first to issue citation bars around the time of the US Civil War. At first, citation bars were given on an unofficial basis, at the discretion of the commander. It was only later that citation bars were formally introduced and awarded. Citationbars.com is powered by The Pin People - Lapel Pins.